These areas were designed to increase children’s love for learning about nature as they freely explore and to help reconnect staff and parents with nature. 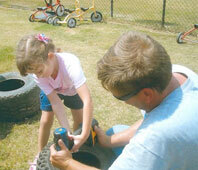 Parents have been instrumental in creating the Nature Explore Classroom. They helped design and create the entrance feature that leads children into this beautiful space, donated materials to fill the classroom and constructed many elements. 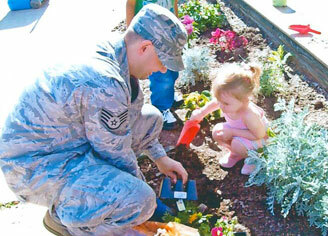 An Arbor Day Celebration was hosted which allowed children, teachers, parent volunteers and other military staff members to assist in planting trees. Plants of varying textures and colors were added to create interest and beauty. Low maintenance plants and herbs were selected thatare suited for the climate in Alabama. The addition of perennials helps to keep down the cost of replacement. The Action Area is a wide open space to run, jump and play and includes recycled tires, balls, a parachute and sprinklers for use on hot days. 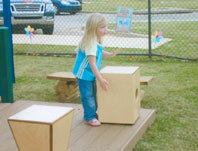 A large flat bottom canoe lends itself to the Dramatic Play Area. Drain holes have been drilled into the bottom of the tires and canoe so that rain water may drain. The Music and Movement and Climbing Area are filled with elements to engage children while hammocks and small Adirondack chairs provide a unique way to spend quiet time reading or just observing nature. A variety of books representing the military community have been included. Siblings also help out by reading nature stories to the children. A mural was painted by the children and placed on the fence of the Nature Explore Classroom. This work of art not only adds beauty to the classroom but also enables the children to take pride in their work.